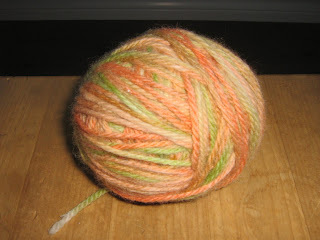 More friends and a blog: Mincemeat, yarn dyeing and smelly dog! Ah, the smells of Autumn. 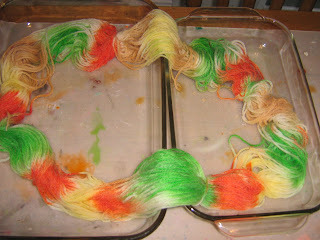 Mincemeat, yarn dyeing and smelly dog! Ah, the smells of Autumn. If you had been at my house on Thursday you would have thought my house smelled delicious. 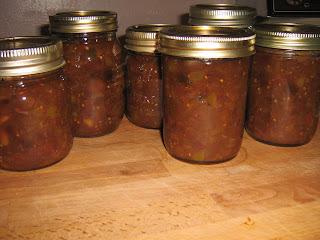 I was making green tomato mincemeat and while that might sound gross it is actually quite good. It is full of cinnamon, allspice and cloves and the delicious smells made our cool house seem cozy and warm. Even if you had been at my house yesterday you might have thought it smelled pretty good. I was making a tofu, chickpea curry to share with my friends at our Equinox potluck. 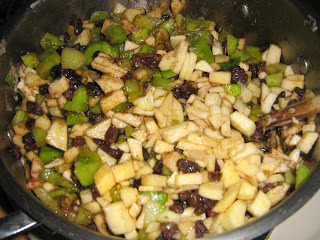 It smells quite good too while it is simmering on the stove. But today? Today as I sit here on the last full day of summer, with the clouds making it dismal and gray outside, my house smells like wet dog...wet dog who has been eating a lot of prune plums, if you catch my drift. If you don't, then you probably don't have a plum-eating dog, and aren't you lucky. :-) On Wednesday my house smelled yucky too, for a bit. We were making some natural dyes out of walnut husks and carrot tops, these don't smell too good while they are simmering away. Although they don't smell nearly as bad as a strong solution of Kool-aid, I think I'd rather have to hang out with the farting dog than to spend a lot of time around Kool-aid. 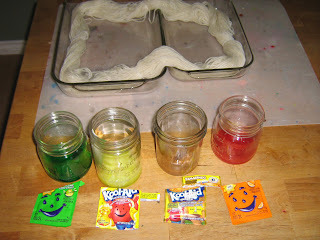 E wanted to use the concentrated Kool-aid solution to dye his yarn. I remember when I was a kid, that in the summer, we used to have Kool-aid as a treat sometimes, and I used to always feel sick after drinking it. 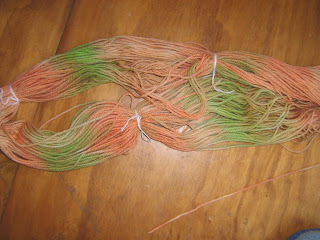 (that didn't stop me from drinking it, mind you, it was a treat and I certainly wasn't going to miss out on a treat) In this house it only get used for dyeing yarn and here are some pics of his yarn in progress. It is pictured at the top of the post as it looks when it is finished.